Potatoes have to be ridged and lifted. These two operations can be troublesome with certain clay soil, especially when the weather doesn’t play along. A healthy commercial crop of potatoes. When it comes to soil pH, many assume potatoes require a low pH, but this isn’t so. Where this matters is in the case of potato scab, which doesn’t like acidic soil, whereas potatoes are very tolerant of it. This enables you to reduce the incidence of scab by planting in soil with a very low pH. Potatoes will do very well in alkaline soil, but if the scab fungus is present, and the variety is susceptible, this can be a major limitation. If you choose to keep the soil acidic to reduce scab, you need to ensure the crops grown in rotation with potatoes will be able to grow productively in such conditions. Aluminium toxicity can also be a problem in acidic soil, and may affect maize. In addition, low pH can affect the availability of phosphate – something else you’ll have to bear in mind if adopting this approach. In fact, many minerals are rendered less available in acidic soil. 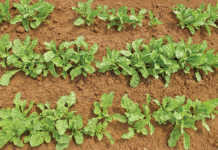 In most cases it would be more practical to grow scab-resistant varieties than contend with the disadvantages of acid soil. You also need to take the climate into consideration. 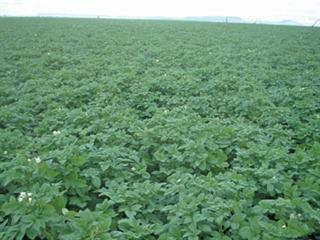 Potatoes are essentially a crop which thrive in cooler conditions, despite being very susceptible to frost. I found this out early in my farming days when I planted a crop in summer in a subtropical climate. The crop thrived with a mass of healthy foliage which raised my expectations. But when I dug into the soil to check the size of potatoes and what sort of yield I could expect, I was stunned to find virtually no potatoes at all! One of the considerations when going into hot conditions is the night temperature. It can get quite hot in the day, but as long as the temperature stays below 20°C at night, the potatoes should be okay. On the Highveld, many farmers plant well before the frosts end, timing things so that when the potatoes emerge, the frosts are over. Frost as the potatoes emerge won’t do too much harm, but if it occurs when the crop is between 15cm and 20cm tall, it will do a lot of damage. Those who adopt this practice usually plant early varieties so as to be able to lift before Christmas to catch higher prices. 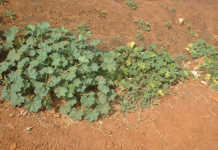 In Highveld conditions, then, potatoes can be planted throughout summer as long as the final planting enables the crop to mature before the first frost. In subtropical areas, you can plant in April/May. Usually the yield isn’t wonderful but can fill a need – especially in remote areas. Temperatures above 30°C can reduce yield. Cool seasons on the Highveld certainly make a big difference in yield potential. 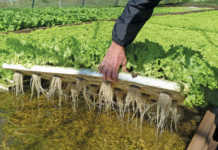 The effect of high temperatures can be partially negated by frequent, light irrigation. Since high temperatures on the Highveld are related to dry periods, if the irrigation method enables you to irrigate frequently it will make a big difference. Yield potential is affected by many other variables, such as soil and air temperature, soil fertility, day-length and sun intensity. You can experiment with planting dates and varieties to maximise your yield, but this will also have to fit into the most profitable harvest date. It doesn’t help if you get a higher yield only to get a lower price if the higher yield doesn’t make up for the lower price. All these factors need to be taken into consideration so as to get the variety and planting date to work best for you.